There is no denying the fact that going fast is an exciting thing to do. But on our roads, that excitement can be smashed like a fly on the wall by all sorts of hazards which can pop out of nowhere. It is a very thin line one has to walk while riding on Indian roads, where a momentary lapse in concentration or allowing adrenaline to take over sanity, can prove fatal. Things can go south any moment and it can happen to the best of riders. 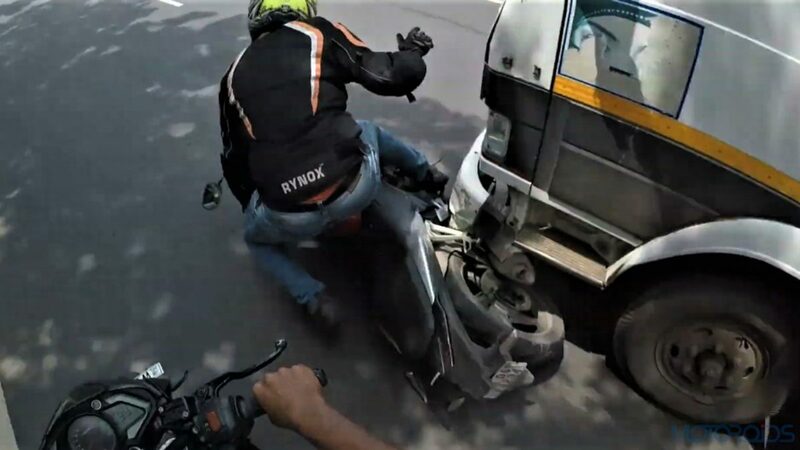 In this video, the rider of a Pulsar 200 is trying to record the motorcycle’s top speed, when a truck cuts into the rightmost lane and pushes him off the shoulder at a speed in excess of 100 km/h! Managing to save the situation somehow, the biker then slows down and pulls to the left to confront the truck driver. In the meanwhile, his friend who was following the Pulsar on a Honda CBR 250 gets into an argument with the trucker. While riding extremely close to the truck, he takes his right hand off in an attempt to slap the truck’s co-driver. Enraged, the trucker swerves to the left and the CBR 250 rider almost gets crushed under its massive weight. With his jeans stuck in the Pulsar rider’s brake lever, he gets dragged further ahead, while his bike gets stuck under the truck’s front bumper before the thing comes to a halt. Scares us to even imagine as what would’ve happened if the biker would’ve stayed on his motorcycle. Let’s hope their experience has some lessons for all of us to learn. A high on the highway which lasts only for a quick moment isn’t worth losing it all away. Trying to get physical and inciting violence to score a mental one-up isn’t worth it either.